Maps celebrate the local identity and the distinction elements with the neighbouring settlements. Summary of the story of Parabiago that has to be put on the map. After a year of work, on december 2007, the Community Map of Parabiago, one of the first in Lombardy, has been realized. 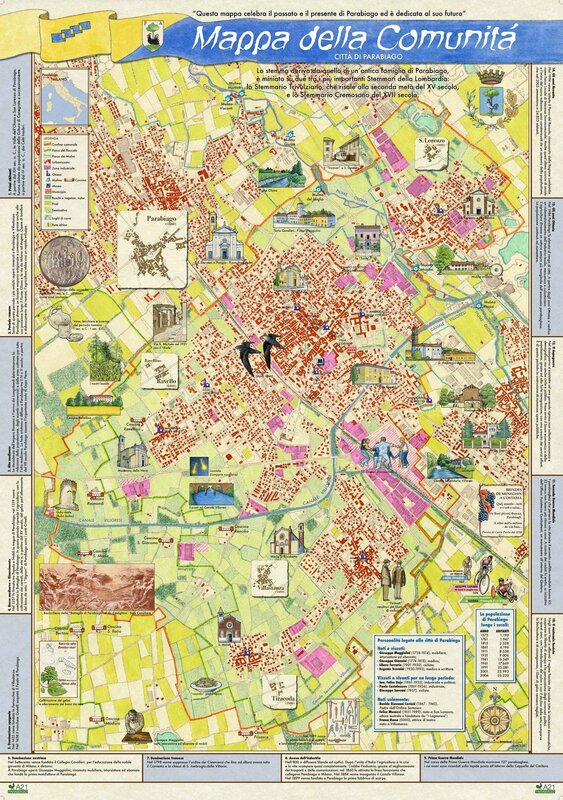 The parish map is a part of the "Ecomuseo del paesaggio" project, financed by the European Union and by Regione Lombardia and promoted by the aldermen to envioronmental policies, Town Planning and Education. This instrument is really useful to share the city material and immaterial heritagen and to create the identity of a town. The Map has been written thanks to a working-group built into the Forum for the Ecomuseum. For the grafic design we have to thank the local artist Patrizio Croci, map expert who drew for years for some national magazines. Croci based his work on the idea of the working group. In the following months a serie of events will be organized to advertise the map, for example, in the council newspaper or in some exhibition. In the meantime the Technical-Political Committee is achieving, with the help of some trainers from the Universities of Milan, the sound-map with the recordings of the sounds of different town-places, and an interactive map. The both two are going to be published in a "beta" version on this Web site. These maps allows to examin in depth the community map contents. Also for these interactive maps is needed the participation and the collaboration of anyone that is interested. Only in this way a map can really become a community map. The community Map of Parabiago has been edited by a work group opened to all the people which is made up of associations, council technicals, politicians and single Parabiago's citizens and bordering municipalities in 2007. The technical Committee wrote a questionnaire subjected to the associations and to the children of the primary and comprehensive schools, and to their relatives. Map of the landscape of the 4th classes of the primary school Manzoni . Map of the landscape of the 4th classes of the primary school S. Lorenzo. Map of the 4th class of the primary school of Villastanza. Also the working group couched some proposals about the contents of the map. In june the working group, using the childrens' maps, discussed the priorities and the contents that have to be in the map, drafting a first proposal of parish map. Between august and september 2007 the local artist Patrizio Croci drew the draft of the map, basing himself on the proposals made, which has been submitted to the work group through the internet and then to the Ecomuseum's planetary forum in november. 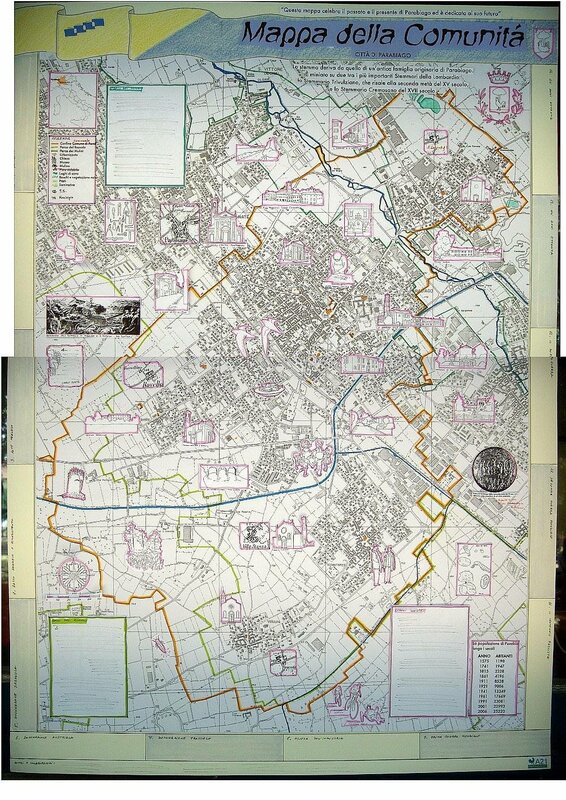 The technic-politic committee and the artist, considering the received comments, finally edited the definitive map and the back of the map, which was distributed to all the families of Parabiago at the beginning of 2008. During this year were edited the sound map and the interactive map. In 2010 the map has been reprinted again. Still in 2010 the “M'appare il parco dei mulini” project which considers the realization on the model of the Parabiago's map of a community and landscape map of the Park in Legnano, San Vittore Olona, Canegrate and Parabiago's municipality has been launched. The third publication of the map, reprinted in 2013, has something new: with the decodification of the QR codes on the back with a smarphone, the reader will be able to access to the numerous cultural patrimony in-depth analyses and how to enjoy it, which are present on the Ecomuseum's website. An "increased" map which keeps the characteristic of being a community expression, the Parabiago's one which intends to work respecting the subsidiarity principle and to share the natural, cultural and storic patrimony. As in many urban contexts, Parabiago is characterized by citizens' widespread inability to perceive the value of places, to recognize in the territory not only the space available to build, produce and move, but also the landscape to preserve and improve. The landscape ecomuseum of Parabiago was born to answer to the “placelessness” or “loss of place” syndrome: citizens do not appreciate the “small scale” heritage that characterize the landscape. Parabiago's ecomuseum is a cultural institution recognized by the Regione Lombardia. Its aims are to study, conserve, enhance and show the landscape; it is a pact with the community to make the landscape clearly and fully visible first of all to its inhabitants and therefore also to visitors. It is clear that some monuments and heritage items shown in the map are not currently accessible by the public, others are little known or abandoned. This is the case of the church of S. Ambrogio della Vittoria, closed to the public and remembered more as “the church of mads” (since was near a psychiatric hospital), than the site of an important cistercian abbey. The aim is to protect, restore and give new function to the heritage elements and connect them to each other and to the surrounding environment system. Before long we'll know if these maps have played a useful role in the local susteinable development. We'll also know if they have been able to effectively deliver a project through which the community draws and ispires her future.